The Simpsons are very popular in Israel. During my first visit in the early 1990s, I saw the whole mishpacha on Ben Yehuda Street in Jerusalem. Much to my surprise, the giant cartoon mascots were promoting frozen TV dinners! 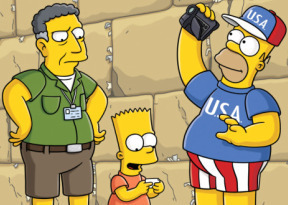 I can only assume they’ll be traveling on Israel’s national airline, but only a few details have leaked out about the Jerusalem-themed episode — including comedian Sacha Baron Cohen being Bart and Homer’s tour guide. I believe that American pop culture can often provide Jewish teaching moments in the classroom. Of course, with the Simpsons, the level of irreverence will determine how age appropriate those lessons can be. I wonder if Bart and Homer will see any flying chairs at the Kotel.